The United States Supreme Court: A Creative Check of Institutional Misdirection? 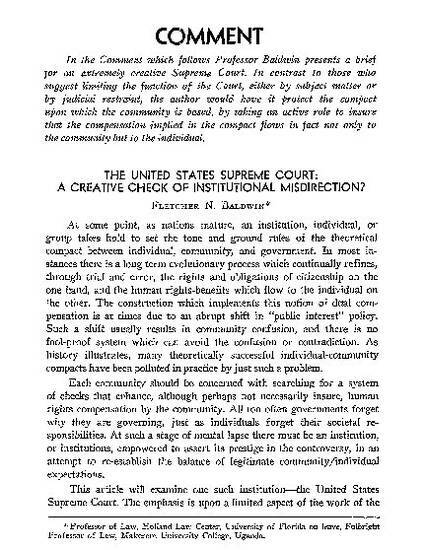 In the Comment which follows Professor Baldwin presents a brief for an extremely creative Supreme Court. In contrast to those who suggest limiting the function of the Court, either by subject matter or by judicial restraint, the author would have it protect the compact upon which the community is based, by taking an active role to insure that the compensation implied in the compact flows in fact not only to the community but to the individual.